Celiac disease occurs in any individual due to an interaction of genetic factors, environmental factors and gluten. The genetic factors are HLA DQ2 or DQ8 as well as non HLA genes. The environmental factors include gastrointestinal infections in childhood, timing and amount gluten ingestion around the time of weaning, and the presence or absence of breastfeeding. Gluten is known to be poorly digested in the upper gastrointestinal tract of man. 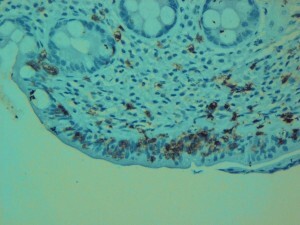 As a result, large molecules of gliadin are present within the intestine. These molecules are available to enter the intestinal lining probably during gastrointestinal infections. These molecules are acted on by tTg that makes them more toxic to susceptible individuals (HLA DQ2 or DQ8 positive). The immune response to the presence of these toxic fragments of gliadin results in cytokine liberation and tissue damage. The tissue damage results in the characteristic pathological finding of villous atrophy and inflammation. A by product of the immune response is the generation of antibodies to tissue transglutaminase and various food products including gliadin. These antibodies are thought to not cause any direct damage and only be by products of the inflammation. There is today no evidence for a direct pathogenic role of anti-gliadin and anti-transglutaminase antibodies. However, it remains possible that the immune complexes formed by these antibodies and their targets transglutaminase and gluten, play a role in the amplification of the local inflammatory response. The second component of the anti-gliadin T cell response is the intraepithelial CD8 T cell response. There are two separate immune processes going on in the intestine with individuals with celiac disease. The first is an immune response in the epithelium, which is the single layer of cells on the surface of the intestine that provides the main barrier for toxic substances preventing them from entering the intestine and it is also the site for absorption of nutrients. 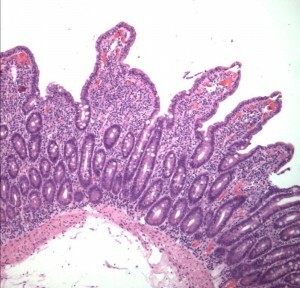 In celiac disease, the epithelium is infiltrated with lymphocytes and the epithelial cells are damaged. The arm of the immune system responsible for this damage is the innate immune system. The second immune process is in the lamina propria, the tissue underneath the epithelial lining of the intestine. This arm of the immune response is the adaptive immune system. This process occurring in the lamina propria is the site of the interaction of gliadin with tissue transglutaminase and the DQ2/DQ8 molecules and the generation of the cytokines that result in tissue damage and villous atrophy. There are many questions that remain and are the topic of a considerable amount of research. These include the role of each of the immune responses in the development of the disease and how these two processes interact. It is also very important to identify all the other genes (apart from HLA DQ2 and DQ8) that may be interacting in any given individual to result in celiac disease. It is through research in these areas that the mechanism of the development of celiac disease will be fully defined. However, it must be noted that there is more known about the development of the autoimmune disease known as celiac disease than any other autoimmune disease. This is because the environmental precipitant, gluten, has been identified. We are not aware of the environmental precipitant for other autoimmune diseases such as rheumatoid arthritis or lupus. Not until all the mechanisms of the development of celiac disease are fully understood can adequate therapies be developed.